In a memorably accurate passage the distinguished English natural history writer and historian Richard Mabey once described Kurt Jackson’s intense fascination for nature, ‘as that of the hedge-boy, burrowing omnivorously – and knowledgably – in archaeology and botany and linguistics, indeed anything that will illuminate both the external sculpturing and what might call the cultural grain of the subject. ’Accurate not only because it immediately distances Jackson’s art from the kind of ‘view painting’ that has distinguished so much British landscape over the years and conveys the way in which it characteristically looks into the landscape rather than at it from afar, but also because it sets down so directly the means through which he both finds, and comes to terms with, his chosen subject matter. It is important to understand this about his work, too, because over the last twenty years or so, during which time he has established himself as one of the most successful (and now much imitated) and interesting British artists working from Nature at the present moment. The truth is that, in each and every case, all his paintings come out of a much more extended notion of what makes a place, one that takes in the dynamics of local history, industry and society and is then further enriched by the real, academically- based understandings of Zoology and Botany, his passionate absorption [one that is very much expressed in the way he and his family live] in ecological issues and his wide readings in poetry and literature. As with this current exhibition, these are normally expressed in a quite remarkably wide variety of working methods, from large canvases to whole sketch book sequences, watercolours and pen and ink sketches and on occasion, sculptural reliefs and prints also, and are usually the outcome of an essentially project- based way of gathering his materials. In the past, this has involved subjects as varied as tracing pilgrim routes across Cornwall, subsistence farming and tin mining in Spain or ancient forests landscapes and charcoal burners in the West of England. More recently, the following of a particular river landscape, for example in France or on the Penwith peninsular of Cornwall [where he lives], seems to have taken on a clear fascination for him, the way a river penetrates, reveals and seems to express the character of the landscape through which it runs. 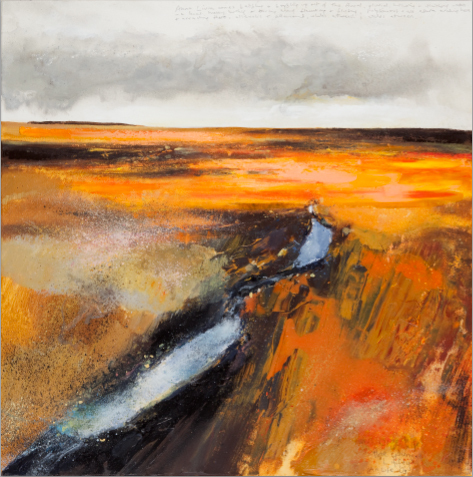 In the present case there is a particular emotional resonance to the tracing of the young Liffey as well, the journey he made to the peat bogs of the Wicklow mountains in 2006, marking his first return in some 30 years to a landscape he had come to as a boy of 16, hitch hiking from London and his first time away from home on his own. Exploring the river from the point where it trickles out of a peat bog to the stage where, at some 20 feet wide and already well clear of the moorland in which it was born, he feels the river to lose something of its essential personality, he is nontheless very well aware of the river, and the landscape’s, literal and political significances. This is, after all, the ‘Anna Livia’ – both voluptuous, flirtatious woman and bubbling, rushing mountain river of Joyce’s Finnegan’s Wake; ‘the wiggly livvly [who] sideslipped out by a gap in the Devil’s Glen’ and ‘laughed innocefree with her limbs aloft and a whole drove of maiden hawthorns blushing and looking askance at her’, as the notation inscribed at the top of one painting clearly acknowledges. For Jackson though, the significance of the poetic moment here is less to do with mood and more to do with the ecstatic sense of beginning to know, as with Joyce, something in all its particularity. ‘Secular epiphanies’ has been one critic’s evocative term for that process of total emersion out of which these works of Jackson’s emerge, first in the landscape and then in the processes of their making, and through which that sensation can finally be invoked in us. For these are works which, quite apart from the fact that they are largely painted, unusually these days, en plein air, employ vigorous often highly unconventional methods and combinations of materials (Guinness beermats for example) that, between them can go beyond seeming merely visual records, suggesting also a strong sense of performance. You can hear the darkly dripping water seeping out of the peat and falling into the brown amphitheatre of a pool that marks the source of the Liffey and feel the horizontal rain in the face as it whips across a young Liffey in full spate- and sense their urgency for him also in the marginalia with which nearly every work is inscribed and which, more often than not, becomes its title. Like Heaney’s Sweeney Astray, you can imagine Kurt Jackson ’…would live / happy in an ivy bush/ high in some twisted tree/ and never come out’.